So, why do I really like the film? To start; it has a lot of heart! Every character in the foster family is likeable and Billy Batson’s search for his mum is a compelling storyline. Billy’s relationship with his foster siblings is heartwarming and it feels like a coming of age movie which would have been made in the late 80s. 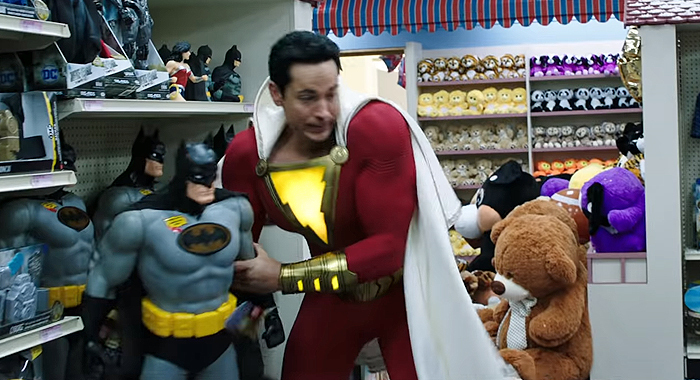 Zachery Levi brings his comedy chops to the character of Shazam and there are moments in this movie that are comedy gold, I specifically enjoyed all the movie, video game and comic book references, including a scene where they play Mortal Kombat X! Jack Dylan Grazer also gives a good performance as Freddy bringing in a lot of the film’s funny moments, the end scene, in particular, being hilarious. Mark Strong’s Dr Sivana was a very interesting villain to me, I walked into the movie not knowing anything about him and I’m happy I did as he had very cool powers which I have never personally seen in a comic book movie before and he brought some of my favourite scenes of the movie. The mythology of Shazam was very well done, the cave where the Shazam Wizard resides reminded me from something like He-Man or Heavy Metal and I loved it. Have I got any complaints about the film? Not really, I would have to really nitpick, if I did, I guess the after credits scenes were a little disappointing as I was expecting something different to happen, but that is down to my expectations. Altogether Shazam! has firmly shown that DC is on track with their movies now, giving me much more confidence in all future films and I’m very excited about a Shazam! sequel and the Black Adam movie. What did you think about the film? Let me know and thank you for reading!